A lifelong learner, Evelyn Carol Barrett has been committed to academia since childhood. She started as a student at Perkinston Junior College (now Mississippi Coast College), where she earned a diploma with honors in 1945, and continued on to earn a Bachelor of Science with high honors from Mississippi Southern College (now the University of Southern Mississippi) in 1947. 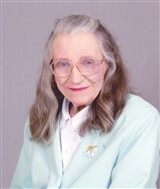 One of the highlights of her journey was obtaining an MBA in accounting from Louisiana State University in 1950, because she was one of very few women in her class. Throughout the rest of her career, Ms. Barrett wove professional experience with her own personal education. Her first step into the field was becoming a typing instructor at the College of Commerce at Louisiana State University, followed by an instructor at Mississippi Southern College. She then spent a year as a clerk-stenographer in the Department of Physics at the University of Illinois, Urbana, a year as a shorthand instructor at Illinois Commercial College, and a year as a teacher at Milford High School. During this time, from 1958 until her retirement in 1990, Ms. Barrett also served as a teacher of business education at Merrimack High School, where she held the title of head of the department from 1971 to 1981. She was passionate about her job, and loved pushing students to reach their fullest potential. Ms. Barrett didn’t want her knowledge to stagnate, however, so she so she made sure to constantly take classes between 1950 and 1982, even traveling to New York University for a few summers in the 1960s. She attributes her success to her continuous networking and learning, as well as to giving everything her best effort. When Ms. Barrett wasn’t working, she was very involved with her community. She was a registered representative of the R. Danais Investment Co., an account executive for John, Edward & Co., an independent beauty consultant for Mary Kay Cosmetics, and a tutor and consultant in shorthand and accounting. Further, she joined the Girl Scouts of the United States of America in roles like senior troop leader of the Switwater Council, adult volunteer trainer, and troop program consultant, and the Hillsborough County Extension Service in roles like organizer and first president of the Merrimack Group. She ensured she remained connected to her peers through association with groups like the Manchester College Women’s Club, Alpha Delta Kappa, the New Hampshire Business Educators Association, the Merrimack Teachers Association, New Hampshire Supervisory Union 27, and the National Business Education Association, among many others. In recognition of her hard work and passion, Ms. Barrett was honored with the Excellence in Education Award from the Merrimack Teachers Association in 1985, the Chapter Award of Appreciation from Alpha Delta Kappa in 1980, and the Distinguished Educator Award from the Merrimack Teachers Association in 1980. She was also featured among the pages of Who’s Who in America, Who’s Who in American Education, Who’s Who in the East, Who’s Who in the World, and Who’s Who of American Women.